Mecar is able to apply a wide range of anti-corrosion finishes to iron, steel, aluminium and brass components with the in-house surface treatment facility. Mecar has developed some specialised processes that are used to protect aluminium fins and sabots from the high temperature erosive environment that is found in mortars and tank guns. 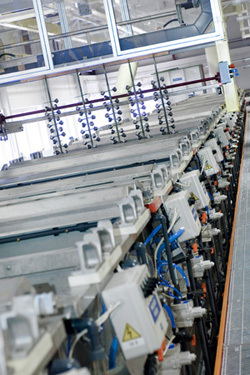 Two automated paint lines are used to provide the finishing touch to all our products. The new service treatment facility allows Mecar to be compliant with ISO 14001.